Throwback Thursday put a ring on it with Ring of Destruction. One of the best traps years ago, this card is Limited and got its texted edited so it could be played once more, along with a bunch of other banned cards. 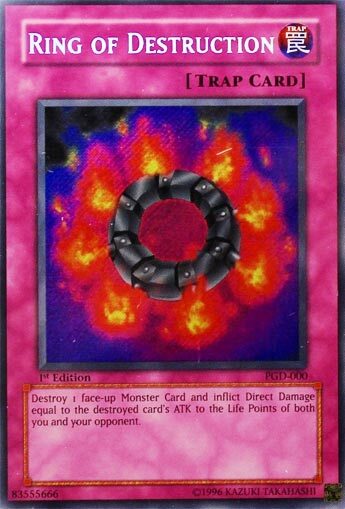 Instead of being able to fire this bad boy off anytime and deal damage to both players, now you are restricted to your opponents turn, only your opponents monster can be targeted, ATK has to be less or equal to their LP, then you take damage first, then they do, and you are restricted to one ring per turn. Wow, that was not watering the card down, that was dropping it in the lake with cement shoes. This card went from an incredible trap to just a good trap. You can still kill your opponent with it, but you can’t kill a monster that is over the opponent’s LP. Back in the day you could ring a high atk monster and do the overkill, now you can’t. Once per turn is understandable. Restriction to only your opponents monsters is a deterrent to you ringing your monster. You taking damage first eliminates the chances of a draw, which I fondly remember in tag duels long ago (1-1-7 with everyone getting a 3500ATK Silent Magician LV8 getting Ring of Destruction). It still does what Ring of Destruction used to do at its core, it’s just not as strong now, but we get to play it again, so that’s good. Ring of Destruction is bad. Targeted destruction is bad. No other card has a restriction that says the damage you inflict has to be less than or exactly equal to victory. Once per turn isn’t the problem. Only opponent’s monsters isn’t the problem. Only during your opponent’s turn is a problem, but not the problem. It’s that the text has killed the card during the End Game. This card used to be good during all phases of play. And now it’s not. With this text, Ring of Destruction is a common card that was misprinted as Secret Rare so long ago. Play Blazing Mirror Force if you think this card is good. At least that card doesn’t target. For Throwback Thursday this week, we look at a once very powerful Trap card that could cause a Draw, and one that received an errata to balance the problems out, Ring of Destruction. Ring of Destruction is a Trap Card that can only be used on the Opponent’s Turn with the errata, which is fine I guess. What it does when activated is it lets you target a monster your opponent controls with ATK less than or equal to the Opponent’s LP, destroy it, and both players take damage equal to the ATK. Ring of Destruction is also a hard once per turn. Despite the errata, it is still a solid disruption card. At 3, this card might see more play and I can imagine them bringing this to 3 now that cards like Bottomless Trap Hole and Torrential Tribute are at 3. This card can still cause a draw, but that is still very situational, it can also win you the game if the monster has the same ATK as the Opponent’s LP, but that is still situational, though less situational than a Draw. Before the errata, this card could be used at any time no matter what the circumstances and you could blow up your own monsters as well, plus it wasn’t a hard once per turn. If that effect was still on this card, it wouldn’t be legal, but the errata makes it a little more safe. Still, at least this isn’t a card that got completely killed by the errata unlike Crush Card Virus or Brain Control. Ring of Destruction…it’s hard to talk about a card like RoD knowing that everyone is going to talk about how it had an errata, and it’s not as strong, and what it can’t do anymore. Honestly, this Trap (pre-errata of course) was probably the most powerful in the game. Which is, of course, why it had to have said errata, right? Well, maybe not. The biggest irk I have with Ring now, is that it can’t cause a Draw anymore. I feel like Draws are a lost art in Yugioh, but I suppose that latter part doesn’t have much to do with the actual card. Getting Banned cards back is fun, but I think they weakened it too much…in my likely unpopular opinion, it wasn’t THAT overpowered to being with. Plus, you still only get one anyway. (That Loop of Destruction Trap is coming, which treats itself as Ring, at least in name, but is garbage, all it does is let you Target and destroy a Monster on the Field dealing 500 Damage to each player. You only get that if a Monster is destroyed on the Field via card effect first anyway…We’ll probably get to that soon I’d imagine). Art: 4/5 Remember when it still had the grenades?